The Gretsch CM1E826 Catalina Maple drum shell kit features an innovative design that provides comfortable playability while keeping hardware longevity in mind. 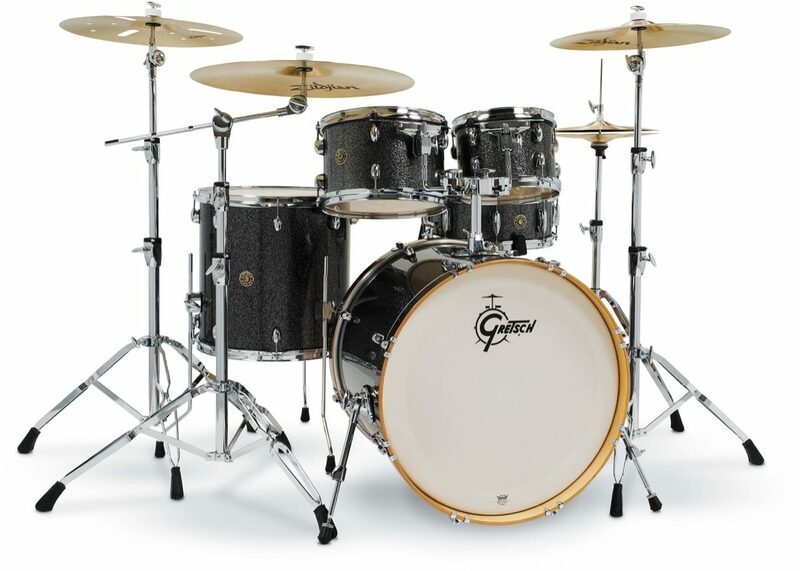 Each drum is built with Gretsch formula 7-ply maple wood along with Gretsch-designed hardware to yield an ergonomically friendly experience -- reducing performer fatigue and unnecessary hardware wear at the same time. This shell kit includes one kick drum, one snare drum, three rack toms, and two floor toms. Gretsch's Catalina Maple series have become a popular choice among many drummers. Each 7-ply Gretsch-formula maple shell features 30-degree bearing edges for rounder, fuller sound. Maple drum shells balance low-end resonance with mids and highs. All drums are ready to rock and come fitted with Remo drum heads. If you're tired of hammering on a starter set and are in the market for something better, this Gretsch shell kit is a great upgrade. Your Gretsch CM1E826 Catalina maple kit utilizes an ergonomic design that not only yields a comfortable feel, but also saves you in the long run on repairs and upkeep. The ball/socket 12.7mm L-arms for your rack toms offer a lot of room for positioning each tom and provide a secure hold for increased stability. Keeping your kick drum hoops looking nice are rubber isolators for the die-cast bass drum claws. All drums feature an attractive black/gold Catalina Maple round badge. Having three toms and an extra floor tom can really go a long way. Aside from looking cool, the extra set of rack toms allow for a wider tonal spread. This opens the door for playing in a greater number of genres and styles. If you're interested in getting a little weird, try putting one of the extra floor toms by the hi-hat and see what interesting fills this orientation can lay at your feet. NOTE: Other hardware and cymbals are sold separately. The Gretsch Catalina Maple CM1 series includes innovative and sleek hardware designs. Each component is designed for functionality, performance and style. The overall result is a great sounding Gretsch drum set that is ergonomically improved and has a fresh, contemporary design aesthetic. The mounting hardware includes round "gas cap" bass drum mount plate, ultra low profile GTS mounting system, reduced-mass tom mount brackets and single and double tom holders. Both tom holders include a post hole for a 7/8" cymbal tube post (not included). The ball/socket 12.7mm L-arms provide positioning freedom and a secure hold for stability. Gretsch T-Wing screws and bolts are included on all fittings for drummer friendly feel and rubber isolators have been added to the die-cast bass drum claws to help keep bass drum hoops looking fresh. To complete the balanced design aesthetic, a black/gold Catalina Maple round badge is included on all drums. The Gretsch Catalina Maple series includes many drum features that have made Catalina Maple series a popular choice among drummers. The shell is a 7-ply Gretsch-formula maple shell with 30-degree bearing edges and natural shell interiors. Bass drums include telescopic bass drum spurs matching maple wood bass drum hoops. Toms/snare feature 2.3mm triple flanged hoops. All drums are fitted with Remo drum heads, including coated batters and clear resonant on toms/snare and clear bass drum batter head with muffle ring. The white Gretsch bass drum logo head includes muffle ring. - Snare: 14 x 6"
- Tom: 8 x 7"
- Tom: 10 x 7"
- Tom: 12 x 8"
- Floor Tom: 14 x 14"
- Floor Tom: 16 x 16"
- Bass Drum: 22 x 18"
NOTE: Gretsch Catalina Maple CM1 7 Piece Shell Kit is only the drums. Hardware and cymbals are sold separately. "Gretsch Catalina Maples are the Bomb!" Overall: First of all, let me say that ordering this kit from zZounds was a breeze and the payment plan is perfect for me. I ordered this kit (with the Walnut Glaze finish. Beautiful!) from them on a Friday and it arrived at my front door the next Tuesday afternoon. I had previously ordered this kit from another company because they were selling it for $100 less, but after waiting a month and a half with no sign it would ever show up, I finally wised up and ordered from these guys. As far as the drums themselves are concerned, I couldn't be happier! They look incredible but, more importantly, they sound even better. The tone off of the toms was great once I got the top and bottom heads tuned the way I like them and the bass drum is indescribably good. Such a magnificent, low "THUMP!" to it with very little effort. I just tuned it low, put a Kickport in the front (don't know that that was necessary, but it's what I did) and taped a 3"x5" patch of felt on the batter head to take a little of the resonance off and it sounds absolutely killer! I read a previous review that says the 8" tom is useless, but I disagree. It's more of an accent drum, but I've used it as part of the whole kit for 3 gigs now so far and have really enjoyed having that extra "color" to work with. The snare is very good, but possibly my least favorite part of the kit. I have been working on adjusting the head tensions on it though and have been happier since then, so perhaps I just need to put a little more work into it to get the sound that I want out of it. That's a small complaint though and, overall, I would say this kit from this company is a fantastic purchase. I am loving that great Gretsch sound and look forward to years of fun playing these babies! Style of Music: Rock, country or whatever the gig calls for. 56 of 56 people (100%) found this review helpful. Did you? Overall: This is my first brand new drum set I have ever purchased. Have been drumming for about 11 years now, just always purchased used. This is an absolutely awesome kit. Great sounds, after a little bit of tuning and tweaking it sounds perfect. Good resonance, great looks, and have no complaints! And the play as you pay option is awesome. Got the whole kit, cymbals, and hardware shipped to my house in one and a half days! If you were thinking about purchasing this kit from zZounds then don't wait any longer!! !